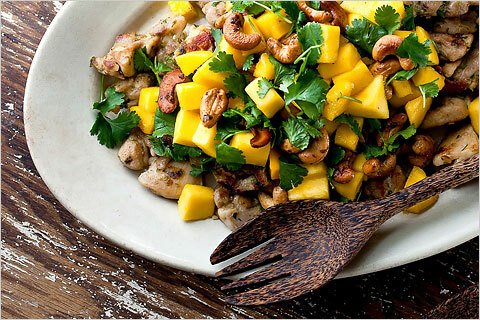 Excerpts from "For Everything There Is a Season, Even Mangoes" by Melissa Clark (NYTimes) and corresponding recipes. "In spring, it’s so easy to become wrapped up trolling the farmers’ market for the first skinny blades of rhubarb or pungent ramps, that you can forget there is an entire world out there, where seasons can differ from ours. In warmer climates, tasty things are ripening, just waiting to be called lunch. Mangoes will never be local fare in New York, but the best ones are starting to come into American markets right now. 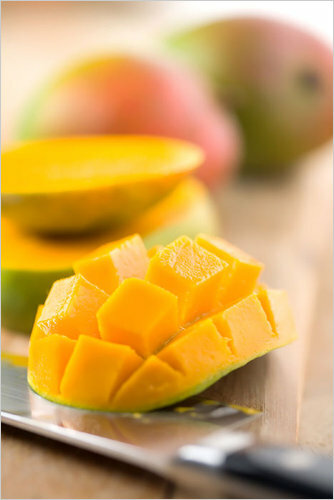 Beginning in April and peaking in May and June, mangoes from India, the Caribbean, Guatemala, Costa Rica and Mexico will fill the bins at produce markets..."
"No matter what variety you end up with, the test for a ripe mango is to gently squeeze it. It should feel soft and slack beneath the leathery skin but not mushy. If your mangoes are firm, put them in a paper bag to ripen more quickly." 1. In a small bowl, stir together the brown sugar, 1/2 teaspoon black pepper and cayenne. Heat 1 tablespoon oil in a large skillet over medium-high heat. Add the cashews and sugar-spice mixture to the skillet; cook, stirring, until nuts are golden, 2 to 3 minutes. Scrape nuts into a bowl. 2. Wipe out skillet with a paper towel. Season chicken all over with salt and remaining 1 teaspoon pepper. Return skillet to medium-high heat and add the remaining 3 tablespoons oil. Add scallions and cilantro stems; cook, stirring, for 1 minute. Add garlic and chicken. Cook, stirring occasionally, until chicken is golden and cooked through, about 12 minutes. Pour in the rum and cook, scraping up any browned bits from the bottom of the pan, until the rum evaporates, about 1 minute. 3. 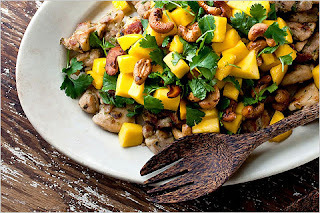 Remove pan from heat and immediately add nuts, mango, vinegar and cilantro leaves. Taste and adjust seasonings, if necessary. Diced mango, green and red pepper, red onion and scallion; and shredded carrot and lettuce, to garnish (optional). 1. If grilling or broiling, heat should be medium-high and rack about 4 inches from fire. Put lamb and onion into a food processor (in batches if your machine is small) and pulse until coarsely ground. Put in a bowl with chili, coriander, cumin and turmeric, and sprinkle with salt and pepper. Mix, handling the meat as little as possible, until combined. Taste and adjust seasonings. 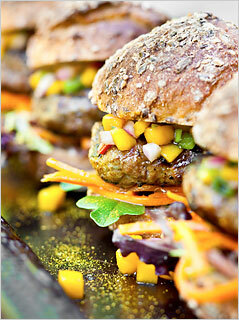 Handling meat as lightly as possible to avoid compressing it, shape it into 4 or more burgers. 2. To broil or grill, cook about 3 minutes on each side for rare and another minute per side for each increasing stage of doneness. For stovetop, heat a large skillet over medium heat for 2 or 3 minutes, then add patties; cook, undisturbed, for about 2 minutes, then rotate them so they brown evenly. Turn once and cook for a total of about 6 minutes for rare. 3. Garnish with diced mango, green and red pepper, red onion and scallion, and with shredded carrot and lettuce.